Black light materials absorb UV/black light and then emit colorful fluorescence almost instantaneously. Light energy gets released very fast in the process. Thus, when the UV/black light is dimmed or blocked, the materials stop emitting fluorescence immediately. B. Color: Four colors available for organic dye. Five colors available for inorganic pigment. The average particle size of organic dye is 1-10µm, containing moisture ≦3%. After dissolved in suitable solvents, the organic black light dye can be completely pervious to light, glowing well and low concentration for use, suitable for ink/paint and plastic injection/extrusion. When applied to ink, organic black light dye should be dissolved in suitable solvents first. 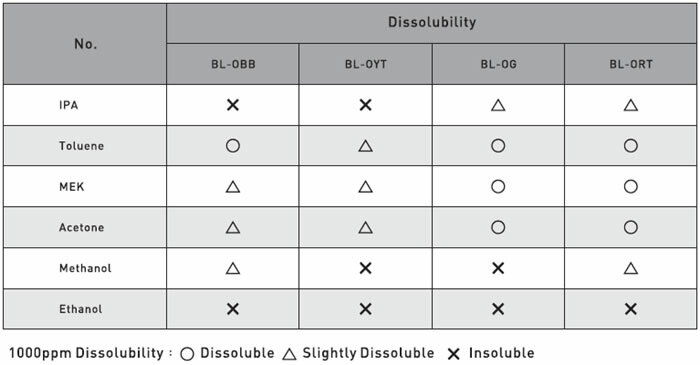 Its solubility depends on the solvent formulations. Organic black light dye is suitable for screen printing offset printing gravure printing, flexo printing pad printing, coating and spray. Applicable to PP- PE -PVC-PU-PS-ABS -TPR-EVA, Nylon and acrylics. Processing temperature should not be over 240℃. It is recommended to use master batch for plastic injection/extrusion to be dispersed well. Master batch should be completely dry before use. When use black light powder for plastic injection/extrusion, well mixing black light powder with lubricants and additives if any before added to plastic for the best result. The average particle size of inorganic pigment is 1-10µm, containing moisture ≦3%. Good light fastness, long durability, suitable for ink/paint and plastic injection/extrusion. Inorganic black light pigment is insolvable in solvents. Applications of the product will be limited by its particle size. The product is suitable for screen printing gravure printing pad printing, coating, and spray, not applicable to offset printing and flexo printing. Applicable to PP-PE-PVC-PU-PS-ABS-TPR-EVA, Nylon acrylics. Processing temperature should not be over 240℃. A. The color of black light powder appearing upon exposure to ultraviolet (UV) radiation will be affected by other fluorescent materials, such as fluorescent dye and brightener. Avoid applying black light powder with these materials, neither the base materials containing fluorescent substances. Better use UV light to check all materials to see if there are any fluorescent substances contained before applications.